Sleep Easy With Custom Pillow Filling From Foam Factory! When someone mentions the word “pillow,” the first thing you probably think of is the one you lay your head on every night. That pillow is obviously the most important one in your life, as you spend approximately 1/3 of your day on top of it. What often goes overlooked though, is the plethora of other pillows that we interact with daily. From extra pillows on the bed and decorative throw pillows on the couch to body support pillows for relief from aches and pains, we rely on these pillows for comfort and cushion throughout the day. But over time, even the best pillows can lose resilience, comfort and the ability to support you. When that happens, The Foam Factory provides a wide variety of foam filling materials to really fluff your pillows. While they aren’t used as frequently as bedding pillows, throw pillows and decorative pillows are still likely to prematurely lose their shape, size and resilience. Even though these forms only receive a fraction of the use of a sleeping pillow, there are a few reasons that their cushion stuffing often fails to last. One big reason is that your bed pillow is made to be used every night, for a long time. Conversely, while some people enjoy using their throw pillows for comfort when relaxing on their furniture, many people only use them for decoration and the materials used sometimes reflect that. Alternately, the people who do use them, use them actively in terms of moving, eating and drinking near and on them. A throw pillow used like that rarely lasts longer than a bed pillow due to the damage opportunities. Another reason they tend to lose their shape is the weight pillows have to support. A sleeping pillow only has to support your head and neck, while a throw pillow may end up being sat on, leaned on, or used to prop up the body, bearing far more weight and pressure. 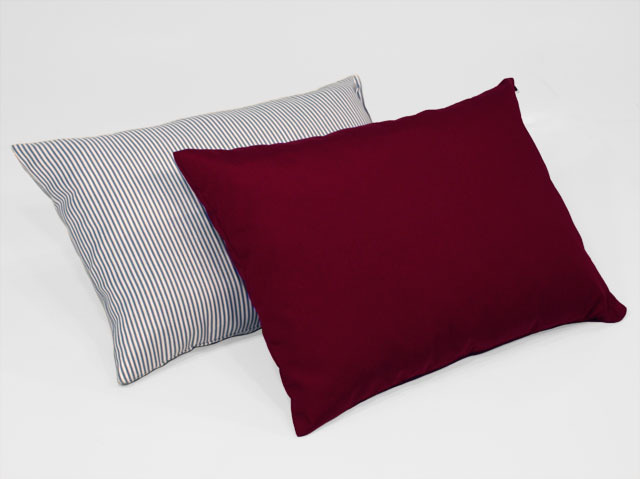 The Foam Factory’s pillow stuffing choices are all made of high quality materials that provide the long-term comfort and support you need from a pillow, no matter how you choose to use it. With their variety of foam filling options, you can make your pillows feel even better than the day you bought them. The foam types The Foam Factory offers stretch from the plushest super soft foam to durable firm foam, all for filling pillows to your personal specifications. Foam inserts can be cut as solid pieces to any dimensions to fill a case for those who want the most balanced feel from a pillow. 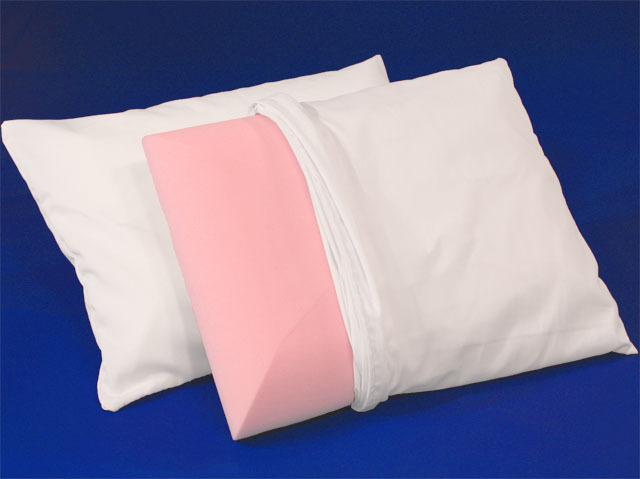 With their computer-programmed machinery and cutting capabilities, The Foam Factory is able to produce personalized and detailed pillow inserts, made exactly to your preferences. 360 degrees of contouring is also possible, with the ability to taper ends and snugly fill covers for a level of customization rarely seen. In addition to standard open-cell foam types, The Foam Factory also offers memory foam pillows in three different densities for temperature-sensitive, body-contouring comfort. For some, solid pillow fill may not be as desirable, like in the case of a decorative pillow. Or, it may not even be practical, like if you’re making or re-filling an oversize body pillow. For situations where pillows are supposed to be incredibly soft, fluffy and cushioning, The Foam Factory manufactures shredded foam out of many different foam varieties. Sold in 8, 15 and 30 pounds bags as well as in bulk orders of up to 1,000 pounds, The Foam Factory shreds all of their standard, non-bonded open-cell foams and blends them for a resilient but comfortable all-around feel. Only top-quality foams are made into shredded foam filler. It is a combination of trimmings from other premium end-products that are too small to be made into another product and full, unused sheets. Shredded foam is not shredded because it is defective, damaged, or a factory-second product. It also does not include the hard skin or crust present on the outside of bulk foam buns. Bags of shredded foam are perfect for creating a DIY pillow and let an individual take on a pillow replacement project without an upholsterer. Memory foam is again available, in shredded form. For people who enjoy the heat-activated contouring of memory foam but find its solid form too firm, shredded memory foam retains the same performance qualities in a more cushioning, pliable form. Polyester fiberfill, also known as Dacron, is another filling option that offers plenty of versatility. Often used as batting to wrap seating and couch cushions for an extra comfort layer and an overstuffed appearance, shredded fiberfill provides a very soft filler for pillows of any sort. With its synthetic fibers, fiberfill is anti-microbial and will not rot, mold or grow mildew and may also be placed in the washing machine, covering fabric permitting. It is also a very flexible and compactible material, making it an excellent option in body pillows that are squeezed, hugged and bent. Dacron is extremely fluffy and is also the most cost-effective way to fill a decorative pillow to its fullest. The Foam Factory offers shredded fiberfill in bags measuring 15 by 15 by 72 inches, weighing approximately 5 pounds. For larger or ongoing projects, multiple sizes of fiberfill in sheet form are also offered which can be rolled or easily pulled apart by hand. Comfort doesn’t need to be restricted to within the walls of your home either. To compliment reclining patio furniture or chaise longues, The Foam Factory stocks filter foam and Dryfast foam for filling outdoor pillows. These materials may be manufactured in solid forms or shredded and feature an incredibly porous structure that allows water to drain away and then be dried by the flow of air. When covered with proper outdoor fabrics, these foam products can be used confidently without worry of rotting, falling apart or the growth of mold or bacteria. A pillow going flat on you can be disappointing, but it doesn’t have to mean you have to buy a brand-new replacement. With custom foam pillow stuffing from The Foam Factory, you can bring old pillows back to life, customize ones that aren’t exactly the way you want, and even make your own. And that’s something you’ll always be able to fall back on. I had a foam filled pillow a few year ago for sleeping and found it to be really comfortable. I have not been able to find a replacement. We have a wide range of pillows available. Check out our comfort and support section. We also have shredded foam filling that can be used as well to give life to your pillow.